Kevin M. Levin teaches American history at Gann Academy in Waltham, MA. He is the author of Remembering the Battle of the Crater: War as Murder (2012) and can be found online at Civil War Memory. Last week Virginia's General Assembly unveiled three plaques listing the names of all the African Americans who served in the State Senate and House of Delegates between 1869 and 1890. It's an impressive stretch of time given our tendency to stick with the official years of 1865-1877 as comprising the years of Reconstruction and the brief period in which African Americans climbed into positions of political power before the legal restrictions and oppression of Jim Crow slammed those doors shut for decades. The decision to honor these men is long overdue, but behind this celebratory occasion is the unlikely story of a Confederate general who helped to make it possible for many of them to serve. On July 30, 1864 General William Mahone was engaged in a pitched battle outside of his hometown of Petersburg, Virginia. The Union army had detonated 8,000 pounds of powder under a Confederate salient and had sent in an entire corps that included one division of black soldiers. By the end of the day Mahone's men had achieved what was a decisive Confederate victory that left scores of black soldier massacred following their surrender. After the war, Mahone remained involved in Confederate veterans activities all the while taking steps to expand his railroad interests throughout the region. Managing what became known as that Atlantic, Mississippi & Ohio Railroad necessitated the need to cultivate political allies in Richmond. Following the financial collapse of 1873 and the loss of the railroad Mahone fully entered state politics. The central political question of the time was what to do about the state's massive debt. Conservative elements proposed paying it off in full, but Mahone and others advocated readjustment downward, which would leave state funds for public schools and other projects. 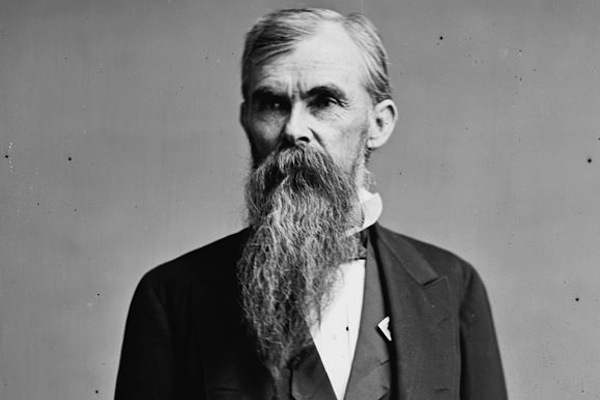 In the 1879 state elections Mahone helped to steer his Readjuster Party to victory by winning 56 out of 100 seats in the House of Delegates and 24 of 50 Senators. With a majority of Readjusters in the General Assembly, Mahone was elected to replace U.S. Senator Robert E. Withers whose term ended in 1880. In the process Mahone helped to forge a powerful bi-racial coalition that controlled the state for the next four years. With Mahone in the U.S. Senate and Readjusters in control of the General Assembly and the governorship, legislation was easily passed. Virginia’s state debt was readjusted downward to $21,000,000 with enough funds left to fulfill campaign promises that benefited poor white and especially African American communities. In 1882 the General Assembly passed legislation supporting the Literary Fund with an appropriation of $379,000, plus an additional payment to public schools; schools with black teachers were also given support. Not surprisingly, more conservative whites perceived this legislation as a threat to established social hierarchies. Perhaps the greatest threat to these established hierarchies was the distribution of political patronage within the Readjuster Party. At the height of Readjuster control African Americans made up 27 percent of Virginia’s employees in the Treasury Department, 11 percent in the Pensions Bureau, 54 percent in the Secretary’s Office, 38 percent in the Post Office, and 28 percent in the Interior Department, including two black women. With Mahone’s help, African Americans also found jobs as clerks and copyists in Washington. The visibility of African Americans in state government constituted a radical change in the distribution of political power and was seen as a threat to white political rule in Virginia. Readjusters also changed the make-up of the public schools. Their reforms increased the number of black teachers and students, and the establishment of the Virginia Normal and Collegiate Institute opened up new avenues of upward mobility. The number of black teachers soared from 415 in 1879 to 1,588 in 1884, and black enrollment went from 36,000 to 91,000 during those same years. The arc from Mahone’s role in preventing a Union breakthrough outside Petersburg that left scores of black Union soldiers massacred on the Crater battlefield to creating an opportunity for the largest number of black Virginians to vote, go to school and serve in positions of local and state government just a few short years later could not be more striking. Could anyone in 1865 anticipate that it would be a former Confederate general who would bring Reconstruction to Virginia? Unfortunately, Mahone's legacy has been forgotten in Virginia. Many pilloried Mahone in the press, including the men who served under him during the war. Even as late as the 1950s, Virginia candidates, who challenged the Democratic Party, worked hard to avoid being associated in any way with Mahone and the Readjusters. Is it time to recognize William Mahone publicly in some shape or form? I say yes, if for no other reason than it would help to bring into sharper focus an important piece of Virginia’s history that places yesterday’s dedication in its proper context. Mahone's legacy and public record also has something important to teach us. The period following the official years of Reconstruction did not inevitably lead to Jim Crow. Interracial cooperation was not only possible in the South between 1877 and the turn of the twentieth century; it was a reality for a few short years in Virginia. Virginia’s Reconstruction was not forced on it by “carpetbaggers” and “scalawags” but by legitimate stakeholders, who believed that a brighter future could be forged for both races. Finally, there is something juicy about all of this being introduced by a former Confederate general. But let’s not get ahead of ourselves. Admittedly, Mahone is not the most likeable person. In fact, in all the years that I researched the man I never caught more than a fleeting glimpse of an emotional life beyond that facial hair. We prefer to be able to empathize with those historical figures we acknowledge and commemorate. More to the point, I still don’t fully understand why Mahone decided to forge a bi-racial coalition. Was he motivated by lingering bitterness over his railroad going into receivership in the early 1870s -- a turn of events that Mahone blamed on Virginia’s Conservative Party? Was Mahone simply thirsty for political power and understood that interracial cooperation offered the best chance of success? Finally, to what extent was he genuinely interested in advancing the cause of the state’s black population? Mahone was a complicated man and his motives were not likely pure, but than again, who among our most beloved public servants could make such a claim. I don’t know what a proper commemoration of Mahone might look like. The city of Petersburg owns Mahone’s postwar home, which now serves as a library and was interestingly enough the scene of a civil rights protest that led to its integration in the 1960s. His boyhood home in Southampton County is owned by the Sons of Confederate Veterans. Perhaps some kind of plaque could be unveiled on the capital grounds in Richmond. The form it takes doesn’t really concern me much. What matters to me is the act of once again taking ownership of a small piece of history that we no longer have a reason to ignore.